Welcome to Weld Like A Girl! Please sign up for email updates so we can let you know when we’ve got more to share! Or drop us a line if you have any questions! Weld Like A Girl is an empowerment project for girls and women, using welding and creativity to boost self-esteem and whole-person wellness. 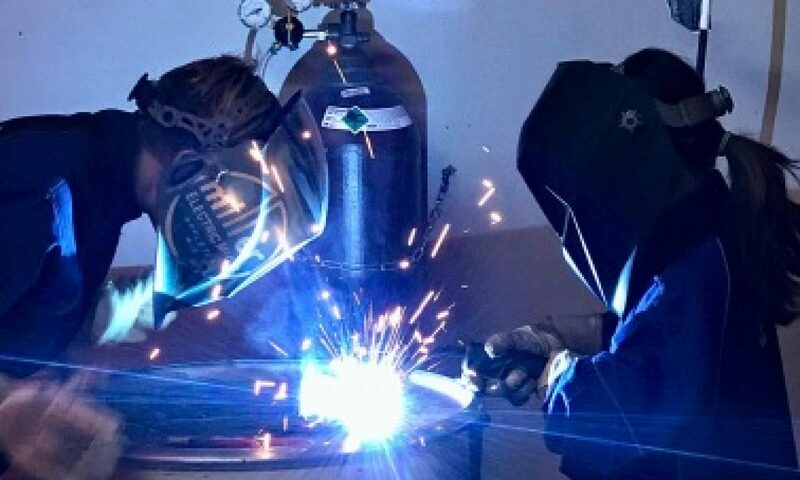 We provide a safe space to explore the mysterious world of welding and cutting hot metal, understanding that this world may be completely foreign and many will need some guidance navigating along the way. We might show up in your neighborhood, at the local college or university, or even in the parking lot at your middle school. The whole point is to make empowerment accessible. If you think you cannot do something then you try it and it turns out you actually CAN do it, just imagine all of the things you CAN do next! We stand for providing girls and women the opportunity to see how badass they really are. We stand for recognizing and embracing the many talents we have, as hidden as they may be. We stand for life-long learning and never selling yourself short. We also stand for Made in America, recycled and green products, family-owned/veteran-owned businesses and companies founded by/run by all women. We do our best to support those folks during our workshops and in our daily business. We are not a welding institute or formal educational program. We do not offer welding certifications or other titles. If you are interested in welding beyond your experiences at Weld Like A Girl, please refer to www.aws.org or your local community college. We are not man-haters. Each of us in life has had good teachers and role models- chances are nearly everyone has had at least one important male role model. We are not trying to exclude boys or men, we are simply providing a safe opportunity for girls and women to try something that might intimidate or scare them at first. *Note: Gentlemen (not jerks) may attend most classes at Weld Like A Girl. If a class is NOT co-ed, it will be clearly marked on the Events page.